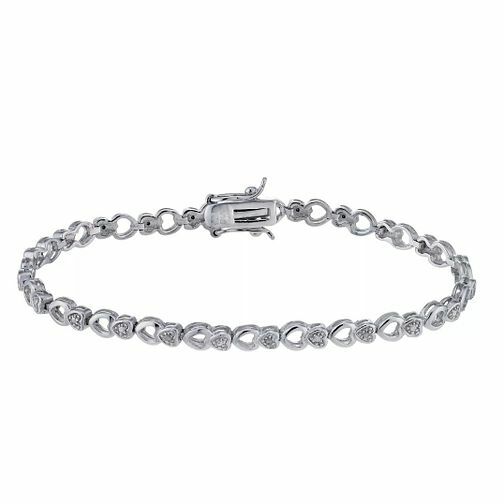 Full of girlie charm, this cute silver and diamond heart bracelet makes the perfect gift for your best friend, or the one you love. Ideal for a splash of everyday sparkle. Silver & Diamond Heart Bracelet is rated 1.0 out of 5 by 3. Rated 1 out of 5 by Anonymous from LOST after 3weeks Received this as a Christmas present from my husband. I loved it but the clasp kept catching on my clothes and falling off. today I lost it! Was looking to replace it without telling him, and discovered how expensive it is!!! Can't afford to buy another one. I feel even worse now. Don't buy this. Rated 1 out of 5 by Anonymous from Lost! Clasp troubles I got this bracelet as a Christmas present and was so happy when I got it! Since then, it's been falling off all the time! It's way too big anyway, with an extortionate amount of money required to take out one link (I needed 3 taken out) and now I have lost it. I wish I had seen these reviews before, and I would have taken it back!